The Massachusetts workers' compensation law provides a system of wage replacement for injured employees whose job-related disabilities prevent them from working and earning their usual wages. A totally disabled worker can potentially recover 60% of his or her average wage over the prior 52 weeks, for example. However, sometimes there is a conflict over what an employee's wage is for the purposes of determining disability benefits. For example, there may be confusion if an employee has not worked the full 52 weeks prior to the injury. A worker employed for only a portion of that time may ask for his or her average weekly wage to be calculated based on a similar employee in the same department. 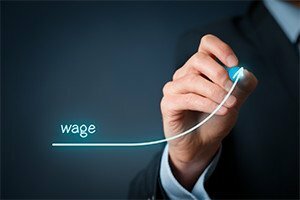 Certain benefits will be included in determining the wage. Natural increases in weekly wages may also be considered. The Boston workers' compensation attorneys at Pulgini & Norton can advise you at each stage of this complex process. As a disabled worker, you may be rightly concerned about receiving permanent total disability benefits that do not take into account what would have happened had you not been hurt on the job. The workers' compensation system was designed to take the place of a personal injury civil lawsuit. The trade-off is that while you can receive benefits regardless of fault, you usually cannot sue your employer for its negligence. In a personal injury case, you can often recover larger damages, including elements such as pain and suffering and, in some cases, lost opportunities for advancement. The workers' compensation system does take into account natural increases in weekly wages. Under Section 51 of the Massachusetts workers' compensation law, people who are injured under circumstances that entitle them to benefits and who can establish that they were of an age and experience when injured that under natural conditions their wages would be expected to increase on the open labor market may be entitled to an evaluation of this fact in determining the weekly wage. For example, if you are an apprentice carpenter and lose your hand on the job before arriving at the journeyman level, you can file what is known as a Section 51 claim to have your average weekly wage calculated using a journeyman's wages. The judge is not supposed to limit this determination to the circumstances of your particular employer or industry at the time of the injury. He or she is not supposed to consider total conjectures about what you could have done in the future, such as your plans for a possible other employment or station in life. He or she can, however, consider your age and experience, physical strength, mental ability, plans for the future at the time of the accident, and personality and how those might have naturally affected your weekly wage in the same general position. If you are seeking workers' compensation benefits for serious or permanent injuries, you should consult an experienced workplace accident lawyer about the issue of a natural increase in weekly wages. At Pulgini & Norton, our Boston workers’ compensation attorneys advise and represent workers' compensation claimants in Quincy, Somerville, New Bedford, and other cities in Massachusetts. Call us at 781-843-2200 or contact us via our online form for a free consultation.